Every other year for almost half a century, experts from two very different fields of research have been meeting to discuss one of the most critical issues facing the long-term success of fusion energy: the interaction between plasma and plasma-facing materials. The 23rd edition of the International Conference on Plasma Surface Interactions in Controlled Devices—PSI in short, which was hosted on 17-22 June hosted by the Princeton Plasma Physics Laboratory (PPPL)—is one of few places where experts in boundary plasma physics meet their counterparts in material science. "The two fields require very different expertise and very few people, if any, have competence in both," explains Richard Pitts, head of the ITER unit that focuses on divertor and plasma-wall interactions. "Although communication between the two groups is constant and the relationship very osmotic, the conference provides a precious opportunity to be reunited in a very convivial atmosphere. It's a very tight community and most of us have known each other for many years." At the PSI conference this year, ITER was strongly represented with three posters and two talks. 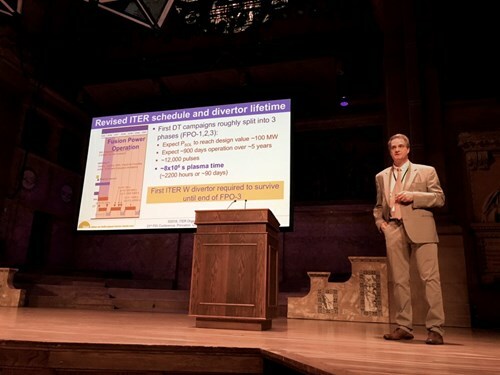 As has been the case for the past 46 years, there was a lot to discuss during the conference—which took place over five days without parallel sessions—based on reports of two years of research at all the major fusion institutes on the planet in this key area. Since ITER now has a robust physics and technology foundation and, although many aspects remain to be refined, the focus worldwide is increasingly turning towards the plasma-wall interaction challenge faced by the many different incarnations of DEMO, the pre-industrial demonstrator for which conceptual studies are now well established in most of the ITER Member fusion programs. "Not everything can be extrapolated to a DEMO based on the ITER concept," says Pitts. "A beryllium first wall for instance is not an option for a reactor, and a tungsten divertor like the one we are building for ITER will face a much sterner heat exhaust test in a device with higher thermal plasma power and neutron production." "Liquid-metal walls" using lithium or tin, innovative divertor magnetic geometries with exotic names like "Snowflake," "Super X" or "XD" designed to spread the exhaust power, and innovative new materials with good power-handling properties and more resistance to neutron irradiation are being actively studied experimentally and theoretically by the ITER partner research community. Materials play the key role as the ultimate boundary condition for the fusion plasma—as future reactors will not be commercially viable if plasma-facing surfaces have to be replaced too often—so it is a natural risk mitigation strategy to seek alternative solutions in parallel with the established science and technology base which ITER represents. Nevertheless, ITER will show us if the conventional route to tokamak fusion energy is viable and the PSI community remains strongly anchored to the ITER concept, continuing to refine the physics basis, to understand how materials will evolve through their lifetime of plasma exposure, and to develop operational scenarios and techniques for robust power exhaust.